Liberty Seated Dime date and mintmark collectors are encourage to submit their collections via this open registry approach. There are many complete date and mintmark sets in circulated grades and the open registry format can provide publicity for these notable achievements along with other sets at varying levels of completion. 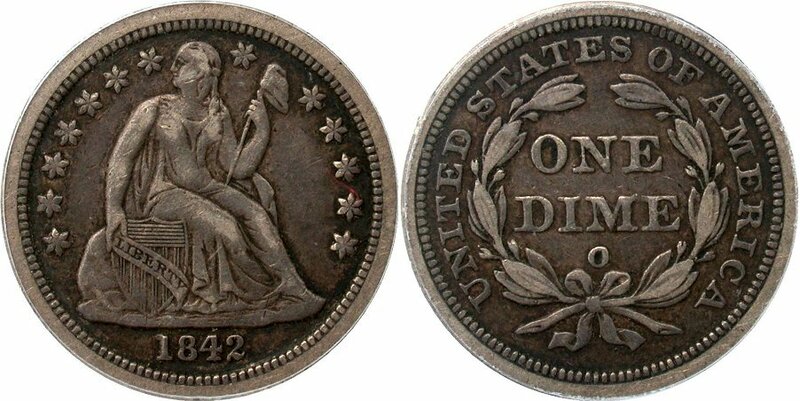 Collecting Seated dimes in mint state is most expensive and beyond the means of many collectors; rather this registry recognizes the efforts of individuals who collect both mint state and circulated examples and wish to have fun with some competitive publicity. The Basic Set input form can be downloaded at the following link; Microsoft Excel Form. Please email your completed input forms to Wuximems@hotmail.com. Your updates will enter a first in and first out queue and will do best to support Gerry Fortin Rare Coin customers with quick responses. Participants are encourage to provide links to online image posting website like www.SmugMug.com. % Completion: Number of coin entries divided by total entries requirement to complete a set; for Basic Set, Business Strikes Set, then 114 entries are required for a 100% completion. Set Weighted Grade: The grade of each coin is multiplied by the "rarity factor", then summed and divided by the total of the "rarity factors" for those coin entries in the set. Set Rating: The grade of each coin is mutiplied by the "rarity factor", then summed and divided by the total of all "rarity factors" for a completed set. % : The ratio of coins certified by CAC whether green or gold sticker. The calculate is total number of CAC coins divided by number of entered coins in the respective set. Rarity Factor: The rarity assessment for each date or variety in EF-AU grades as per the estimates at www.seateddimevarieties.com.